36 Comments Posted October 30th, 2008 . Halloween! I love it. The costumes, the candy, the cooler weather, the parties, the decorations and of course, carving pumpkins – a plethora of fun for all ages. Hmmm…all that spooky fun can cause a lot of consumption and waste. Chad and I found some ways to manage our haunting excesses, and I’m certain we could always be doing more. Buying local pumpkins was a cinch. Boone Hall Farms, hosts a Fall Festival with one of my boys’ most favorite places, their pumpkin patch. For five dollars, your kids will also love the jump castles, mazes, goats and tractor ride (check out all that bamboo!) This fun filled event is a mere 2 miles from our home. 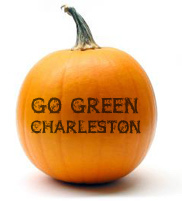 I’d love to hear where you all are buying your locally grown pumpkins. Then the carving fun begins. Chad and I are looking forward to composting our pumpkins again this fall. From the pulp to the seeds to the sorry rotten faces jack-o-lanterns become, all will be put back into our own gardens. We try to reuse our decorations, Chad does a great job organizing the crafts we’ve created or purchased, packing them all away for the year. After four years, most of our spooky fanfare appears new. We did, however, make one trip to a Halloween shop – the mad scientist supplies have proven worthwhile. Anyone need a potion? While Chad and I will be wearing old costumes again this year (he’s really devoted to Obi Wan), our boys do have brand new costumes. Perhaps we should have visited Goodwill for the Thomas the Tank costume, but it’s a special moment when a little guy opens his new costume. I also cannot resist handing out candies to our neighborhood trick-or-treaters. I thought about more practical reusable hand-outs, such as pencils, but I believe the whole family would protest, loudly. Maybe next year, when chocolate is easier for me to resist! My biggest disappointment was my lack of a voice in planning the school party, even though I volunteered. I will try not to grumble about the fancy designer Halloween paper plates, napkins and cups our school children will be throwing into trash bins. I suggested one stack of Seventh Generation supplies to last a school year full of little parties. I guess my idea wasn’t cute enough. Again, I will try not to grumble. My boys are counting the days until Halloween, and I look forward to answering the door to little pirates and princesses. Don’t forget, there is no reason to buy a pail or sack for collecting all those goodies. An old pillowcase has been my favorite Halloween bag since I was dressed as a tiger shouting, “Trick or Treat!” Have a safe and spooky Halloween! Hey there, You have performed a fantastic job. I’ll definitely digg it and personally suggest to my friends. since at least the third century as criminal, entrepreneurs and marauders. Exclusive Cloud Atlas DVD with Ultra – Violet and Vudu digital copies, available on DVD and Blu-ray Combo Pack. You can tint your eyebrows by yourself and can find the the tint at most beauty stores. You’re so cool! I don’t believe I have read something lioke this before. thoughts on this subject. Seriously.. thanks for starting thios up. a taboo matter but usually folks don’t talk about these topics. That could be the finish of this article. Here you will locate some sites that we feel youll value, just click the hyperlinks. We prefer to honor lots of other internet web-sites around the web, even when they arent linked to us, by linking to them. Underneath are some webpages worth checking out. That will be the finish of this report. Here you will obtain some sites that we think youll value, just click the hyperlinks. Always a huge fan of linking to bloggers that I enjoy but dont get a great deal of link appreciate from. Below youll come across the link to some web-sites that we believe it is best to visit. We like to honor numerous other net web pages around the internet, even when they arent linked to us, by linking to them. Underneath are some webpages worth checking out.